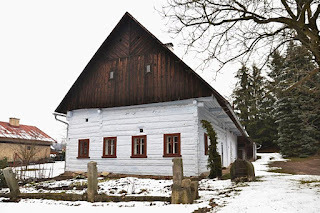 Czech Genealogy for Beginners: The oldest log house in Bohemia? In Rtyně! 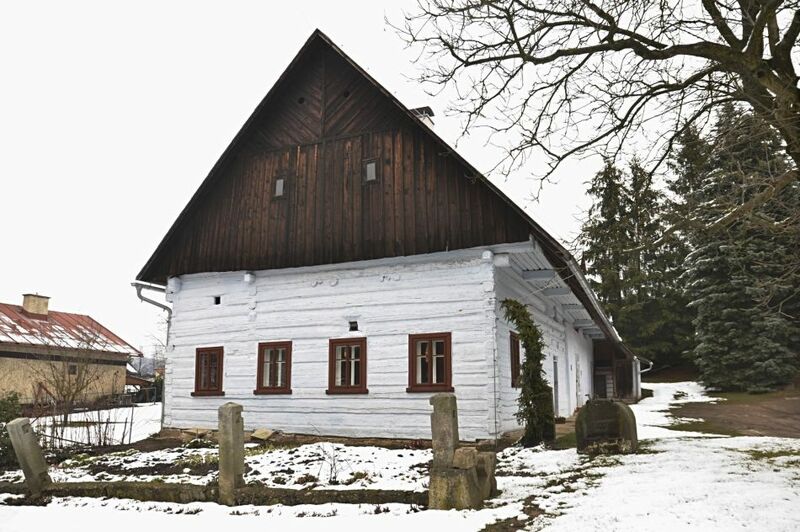 The log house located on the outskirts of Rtyně was in a very bad condition few years ago and its owners planned to demolish it and build a new house. When they discovered how old the house was, they restored it and it belongs among protected (listed) monuments today. Its history goes back to the 16th century. The Rtyně log house is different than other cottages even at the first sight. Not only the logs have white color, but also ceiling in the main room is higher than usual. It suggests that the house had so called "smoke-room". 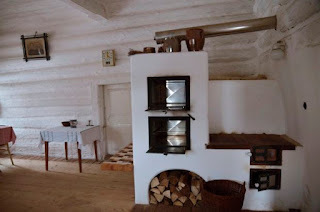 It means the room was not heated by stove, but open fire was used for heating and cooking. The smoke concentrated in about one meter high area under the ceiling, so the ceiling was one meter higher than usual. 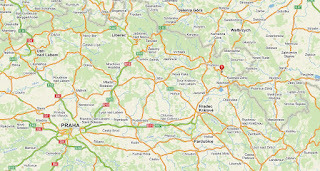 Rtyně is located in Eastern Bohemia. There is also a small window between normal windows in the gable wall, used as a ventilation. It lets the smoke go out of the house and also draws fresh air into the house. The smoke also preserved wooden logs and they therefore turned resistant to wood pests and wood-destroying fungus. High ceiling and high probability of a "smoke-room" existence were registered by conservationists who informed the owners about a fact that the log house could be a historical monument. They insisted on a detailed examination of the building before its demolition. Probes into old balks show the unbelievable age of the house. The house was most probably built in 1547-1548. This surprised not only the owners, but also the historians. After this discovery the owners decided not to demolish the house, they rebuilt it and are proud of it. Visitors have a chance to see the evidence of lives of our ancestors in the 16th century. The family of current owners bought the house in the beginning of the 20th century and old documents and contracts show that the owners were always farmers. Some were doing well, some were poor. The log house had many owners during last 400 years. Contracts always included information about fields belonging to the house, how many animals the owner had, which tools they owned and so on. It was never only a house. But there was not too much furniture in the house. Not only the smoke wasn't good for a painted chest, but there lived as many as 15 people of a different age in the house so there was not enough space. There was of course a large table, beds were only for older generations and others simply had to sleep on benches. Thank you for this translation. Very interesting.